A "stimulating" account of the capitalists who changed America in the late 19th and early 20th centuries, setting the stage for the 1929 crash and Great Depression (Kirkus Reviews). In the decades following the Civil War, America entered an era of unprecedented corporate expansion, with ultimate financial power in the hands of a few wealthy industrialists who exploited the system for everything it was worth. The Rockefellers, Fords, Morgans, and Vanderbilts were the "lords of creation" who, along with like-minded magnates, controlled the economic destiny of the country, unrestrained by regulations or moral imperatives. Through a combination of foresight, ingenuity, ruthlessness, and greed, America's giants of industry remolded the US economy in their own image. They established their power and authority, ensuring that they-and they alone-would control the means of production, transportation, energy, and commerce-creating the conditions for the stock market collapse of 1929 and the Great Depression that followed. As modern society continues to be affected by wealth inequality and cycles of boom and bust, it's as important as ever to understand the origins of financial disaster, and the policies, practices, and people who bring them on. 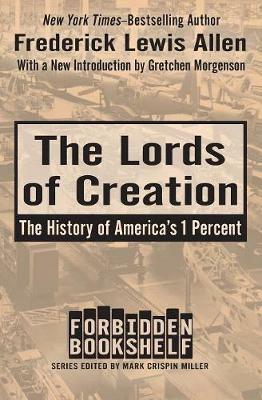 The Lords of Creation, first published when the catastrophe of the 1930s was still painfully fresh, is a fascinating story of bankers, railroad tycoons, steel magnates, speculators, scoundrels, and robber barons. It is a tale of innovation and shocking exploitation-and a sobering reminder that history can indeed repeat itself.